I started a chocolates and confections class, and I am in love. Truly in love. Yesterday I made salted caramels, passion fruit macaroon, and a few other goodies. I stood for a while wrapping each individual caramel in handmade parchment wrappers. I was in heaven. It was so relaxing and enjoyable. I would rather do that than make fondant flowers or decorate a cupcake any day of the week. I found a new love and passion. I have always loved eating caramels, and chocolate but now I know I equally love making them. For a mid term project we each have to develop one or two chocolates or confections. The recipe, the packaging, and the logo or brand. I am super excited about this of course. I have a few ideas up my sleeve that I am working on, and next week we will be testing our recipes in the kitchen. I will keep you posted on this project. A part of it will be working on my logo that will be used for my blog, and my branding. That said here are some hand pies! Note: I prepared the dough and got it in the fridge and then got to the apples. You can use a stand mixer with paddle, your hands and a bowl, or a food processor. It is up to you. I used a stand mixer for this recipe. If using your hands, just make sure to keep your ingredients super cold while working. If they get warm, put them in the freezer for a few minutes, and try again. Depending on the weather, you may need more or less water. The air was dry the day I made this, so I had to add 1 extra ounce/2 tablespoons of water. Other days I only use 2 ounces. So just keep an eye out on the water, add a little at a time. 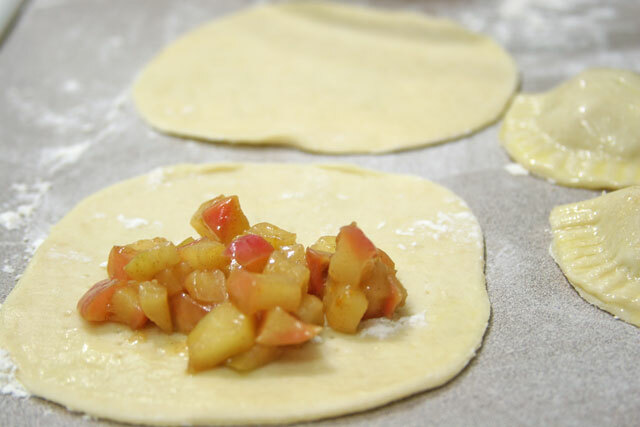 The dough should come together, not be sticky or crumbly. Right in the middle. 1. Place the flour, sugar, and salt in the mixer, mix until combined for a minute. Add the super cold cubed butter chunks, and mix on medium speed for a couple of minutes, or until you see larger chunks breaking apart. Keep the chunks on the larger size for flaky crust like this. 2. 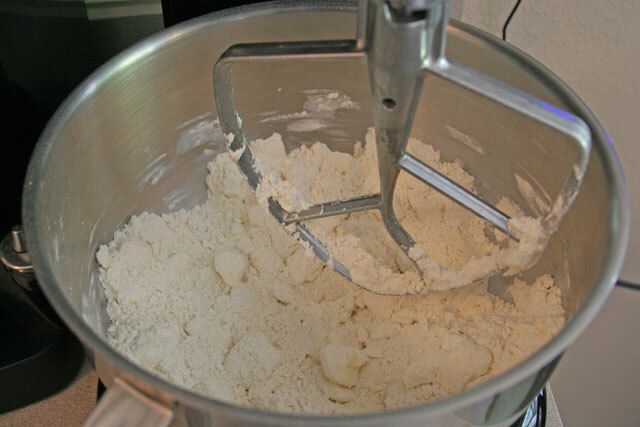 Turn the mixer on low and add the super cold water in a steady stream until you see the dough come together. Stop the mixer, do not over mix here. You will be using your hand to bring the dough together all of the way. If the dough is not coming together, add a tbsp of water at a time until it does. 3. 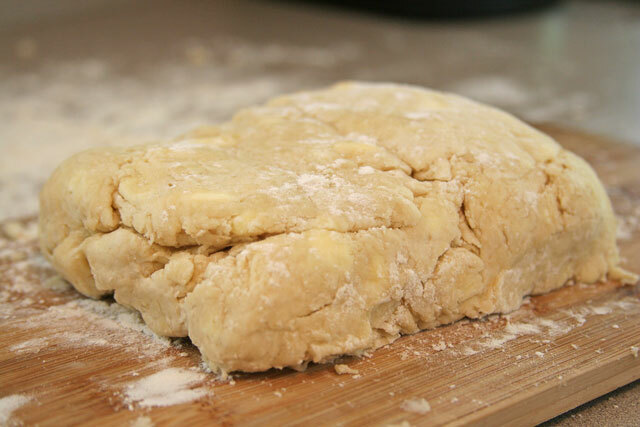 Place the dough on a lightly floured counter, and bring the dough together with your hands. Cover with plastic wrap and place in the fridge for 30 minutes. Start working on the apple filling. Take the dough out after thirty minutes and roll it out to 1/2 inch thick. Take 1/3 of it and fold it in, then fold the other 1/3 in. Place it in the fridge again for 30 minutes. 4. Remove dough from fridge. Lightly dust the counter with flour. 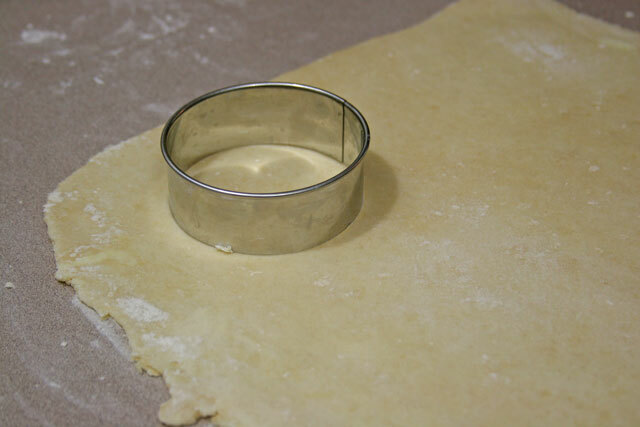 Roll the dough out to 1/8-1/4 inch thick. Take a round cut out about 3-4 inches wide, a cup, or a bowl work too. Cut out circles, and set aside ready to assemble. I rolled out each circle a bit more to increase the size of each pie to about a 5 inch circle. Leave the skin on the apples. There are all sorts of good stuff in the skin, and with small bites like these the skin does not affect the mouth feel of the pie. In a large pie I would always take the skin off. 1. Place the butter in a large pan. Melt the butter over low heat to begin the brown butter sauce. Lower the heat if the butter begins to smoke. Cook the butter for about 10-15 minutes, or until browned. Whisk together the honey and maple syrup, set aside. 2. While the butter is browning, zest and juice the orange, set aside. 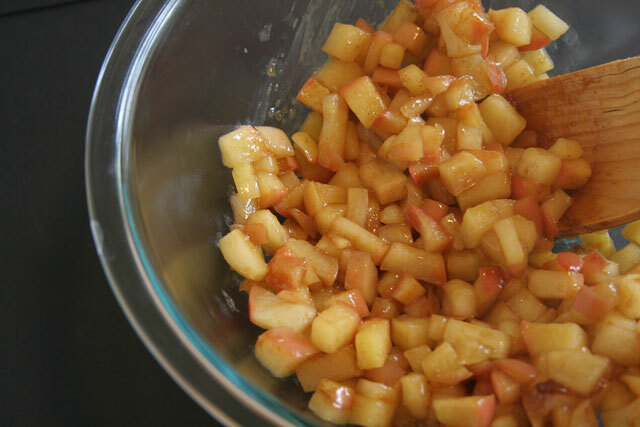 Cut the apples into small pieces about 1/4-1/2 inch cubes. 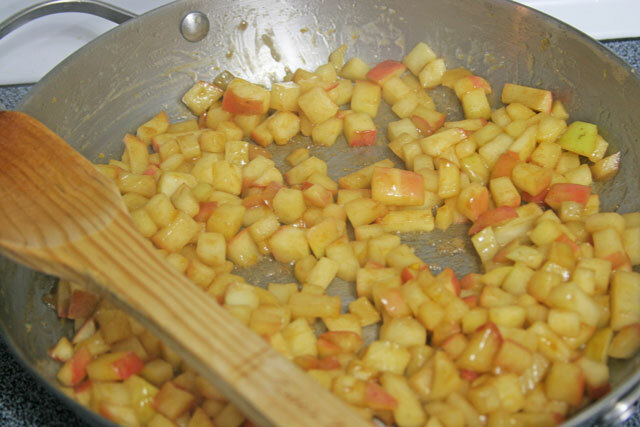 Add the orange zest and orange juice to the apple immediately to avoid browning of the apples. Set aside. Once the butter is browned, add the apples to the pan. 3. Sprinkle 1 tsp of salt over the apples, stir to combine. Add the maple/honey mixture to the pan, stir to combine. Cook over medium low heat for about 15-20 minutes. Stir every 5 minutes or so. Remove from heat and place in a bowl on the counter to cool. 1. Using your finger, brush some egg wash around half of the dough circle Take a fork and dock the same half of the dough a few times. Fill the center of that same half with 1-2 tablespoons of the apple filling. 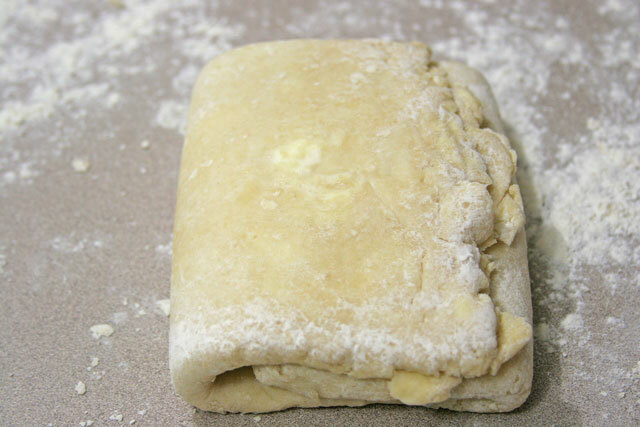 Fold over the dough to seal. Use a fork to seal by gently pressing it down to make the fork lines. 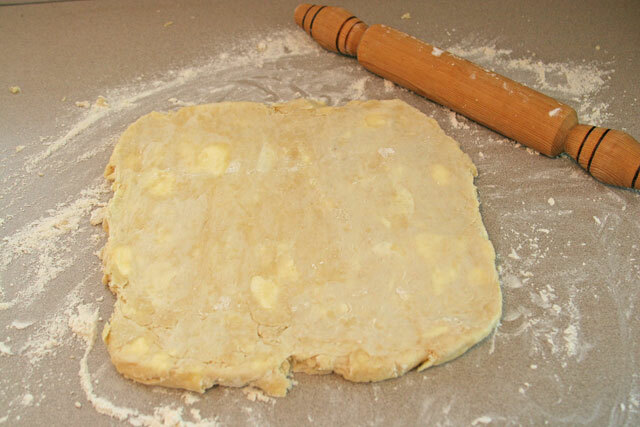 Use a very sharp knife to cut slits in the dough to let stream out. Make sure the slits go all the way through the dough. Brush the top with egg wash. Sprinkle with sugar and a pinch of salt, crunchy sea salt is best here (because I love salty sweet goodies). 2. Place on a sheet pan lined with parchment paper. Bake for 20-25 minutes, or until the tops are golden brown. I’m so excited to try making these for my son’s 5th birthday party. He loves apple pie and wanted it for his party. With 12 kids and 14 adults I think hand pies are the way to go! BTW I’m in Portland, too! I’m trying to perfect a GF Pie Crust. 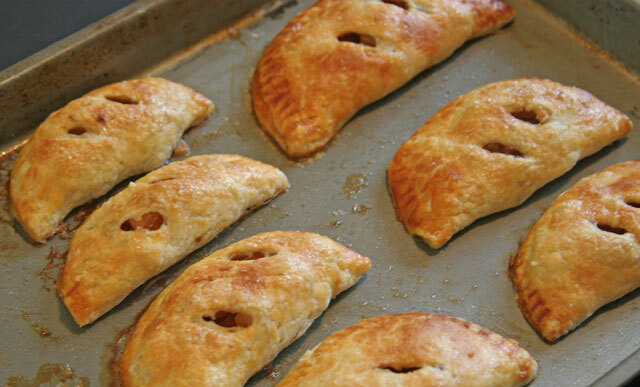 Adorable hand pies, I love brown butter and apples! Wow, these look so lovely!! I love that you added maple syrup to it! Thank you, Julie. Honestly I love the maple syrup versus using cinnamon. It made the recipe a huge keeper. I can’t wait to try this recipe! Homemade hand pies looks so rustic and flavorful! And these are so good, and a reliable recipe! Which is key to a good dough. Ohhh, these look so good!! !